Entra en la hermosa Half Moon Bay desde esta unidad de planta baja. Esta encantadora planta baja, de dos habitaciones, se encuentra justo en Half Moon Bay, en el exclusivo complejo La Sirena. La vista al mar es increíble de toda la unidad. Caminar 50 pies y estás esnórquel el aclamado Half Moon Bay. La unidad era propiedad de un artista local que creó un encanto mexicano encantador. Los nuevos propietarios han actualizado servicios como WiFi, aire acondicionado, reproductor Blue Ray, Netflix y sistema de sonido. El complejo está situado en la parte tranquila de Half Moon Bay a poca distancia de Yal-ku - un lugar único para bucear. El patio interior del complejo es un oasis encantador, con una gran piscina. chef privado y masajista disponibles - véase el libro inquilinos en el apartamento. Hay un mercado de productos frescos en el centro de Akumal en las mañanas de los miércoles y sábados que puede ser divertido y conveniente para recoger productos frescos y sin trekking a la Chedraui. My family of 4 stayed over Christmas and New Year. The view was phenomenal, the snorkeling ok; lots of fish, sea urchins, stingrays and we even saw squid! But the coral reefs are almost all dead in the immediate swimming area. The hosts were wonderful and very responsive. The location was close to many destinations while still tucked away for a quiet night. The description of the property is spot on. We thoroughly enjoyed our stay and the home was fantastic. Don't hesitate on booking! My family (three kids, hubbie and I) just spend a wonderful five days at La Sirena #2. We were impressed with Paul and Mona's attentiveness and service while preparing for the trip, and when we arrived we found that thoughtfulness in apparent in the condo - from the lovely guest book, to the great selection of books and board games, to the well-appointed kitchen. Steps out back is the ever-changing bay and an entertaining selection of birds and animals. The kids enjoyed the pool and we all loved walking to dinner and playing board games in the lanai. Great vacation! We went for a wedding, so had the opportunity to check out several other condos in the area. All were really nice, but I always thought to myself that “ours is nicer”. It was well and tastefully appointed. It didn’t feel like a rental. The furnishings were lovely, pots and pans were nice, the dishes were cute. When we go back to Akumal, we’re staying there again! I have visited the Mayan riviera consistently over the last 10 or so years and have stayed in many different homes / hotels throughout this period, I can gladly say that this is the place I will definitely go back to. 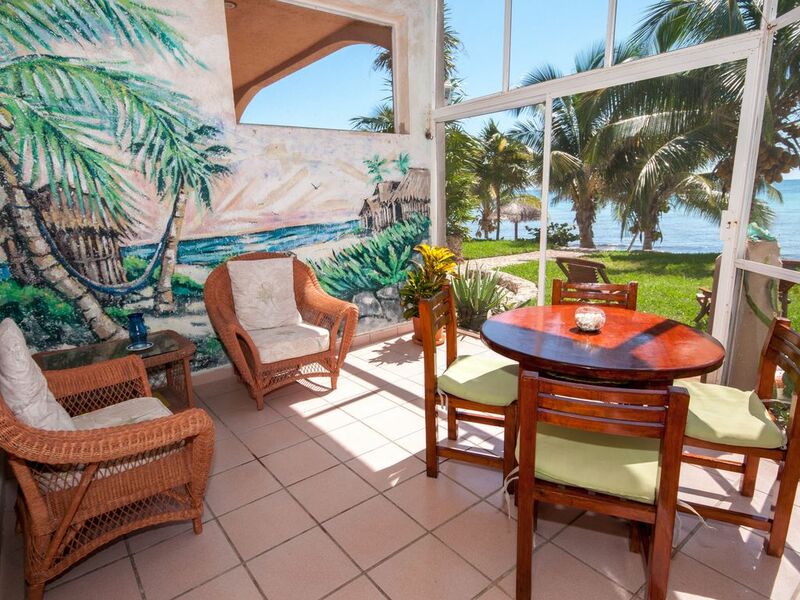 In short, the condo has everything you need, its very clean, its 40 steps from the water, the people attending to the property are very nice and has a lot of different restaurants / bars you can visit within a walking distance. We had a relaxing stay here after touring the Yucatán. Accommodation provided everything we needed. Daily maid service was wonderful. Akumal es una comunidad de playa relajado iniciado por los buceadores. El snorkeling y el buceo es genial. Hay ruinas mayas cerca. La pesca deportiva es muy bueno. Hay 5 campos de golf a 45 minutos en coche.